Reconstructing the two haplotypes of a diploid organism (also known as phasing) is an important problem with applications in fundamental research but also in clinical settings. So far, second generation sequencing data was insufficient to accomplish this task: fragments were too short to bridge "variant deserts". Emerging sequencing technologies hold the promise of allowing for read-based phasing. On the computational side, most formalizations of the corresponding optimization problem are NP-hard. In an approach called WhatsHap, we demonstrated that (i) the problem instances encountered in practice can be solved using a fixed parameter tractable (FPT) algorithm and (ii) that read-based phasing indeed delivers excellent performance once the reads are sufficiently long. Proceedings of RECOMB, pp. 237-249, 2014. CLEVER is a read-pair based method that features a fast algorithm for clique enumeration. It is able to find twilight zone deletions because it does not discard concordant alignments but processes all read pairs. LASER is a read mapper geared towards detecting alignments that cover insertions and (potentially long) deletions with high sensitivity. MATE-CLEVER is an integrated workflow that uses CLEVER and LASER and is able to genotype insertions and deletions. Furthermore, it can leverage information on family structure in a Bayesian framework. CLEVER, LASER, and MATE-CLEVER are available as open-source software as part of the CLEVER ToolKit (CTK). Viruses (like HIV, for instance) exhibit a fast mutation rate and hence evolve within a host. As a result, the host is not infected by a single virus type, but by a population of genetically diverse viruses. Knowledge of the spectrum of present virus haplotypes and their relative abundancies can be important for the choice of treatment. On current second-generation sequencing machines, such a virus population can be sequenced to very deep coverage at moderate cost. Reconstructing haplotypes from the resulting sequencing reads is computationally challenging, though. In a recent project, we met these challenges and introduced a haplotype reconstruction algorithm that is able to reconstruct full-length haplotypes (given sufficient coverage and genetic diversity). The observed error rates are lower by about two orders of magnitude compared to previous approaches. Our software implemetation HaploClique is available from github. Proceedings of RECOMB / PLoS Computational Biology, 10(3), pp. e1003515, 2014. The Genome of the Netherlands project has sequenced the whole genomes of 750 Dutch individuals from 250 families. Applications of these data include building high-quality reference panels for imputation, studying de novo mutations and the corresponding mechanisms, estimating the rate of such events, analyzing population structure, among many others. We contributed to this project as part of the Structural Variations subgroup and provided algorithms for the discovery and genotyping of structural variations. The Genome of the Netherlands Consortium. Nature Genetics, advance online publication, 2014. Many bioinformatics tools use the reference genome of a species under study. The used reference genomes are linear, i.e. they consist of one DNA sequence per chromosome. 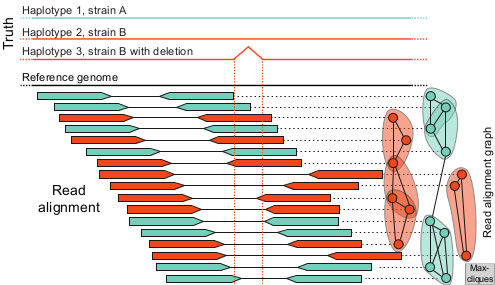 For instance, programs to align next-generation sequencing reads will map the reads to such a linear reference genome. Likewise, tools to call variants like SNPs and structural variations do that with respect to this reference genome. Today, however, information on common and rare variants is available for many species (and, most prominently, for Homo sapiens). To leverage this additional information, linear reference genomes should be replaced by variant-aware reference genomes. We develop data structures and algorithms to achieve that.